I like cooking. Wait, no, no I do not. I like eating though. Very much. I also had gastric bypass last year and have lost 130 lbs thus far. I have a Journey to the 10KM where in May I will be running my first 10KM, mostly because I am crazy and also because I want good health or whatever. As part of my entire journey, I have learned to meal plan. My kids and I are obsessed with planning meals. We go on Pinterest and Recipe sites and prepare months worth of meals. We are finishing our first three months of this process and we have had a great success. My husband is happy with the process, though he has asked for “less quinoa and kale please.” He and one of our sons do most of the cooking; I am the organizer and the eater! Our meals are not diet meals. We like to try new things and some are super healthy and some are less healthy but a treat. I am not a dietitian, nutritionist or any expert in health. What I am is someone who shares her life journey openly online and have a following of amazing people, most I now consider friends. 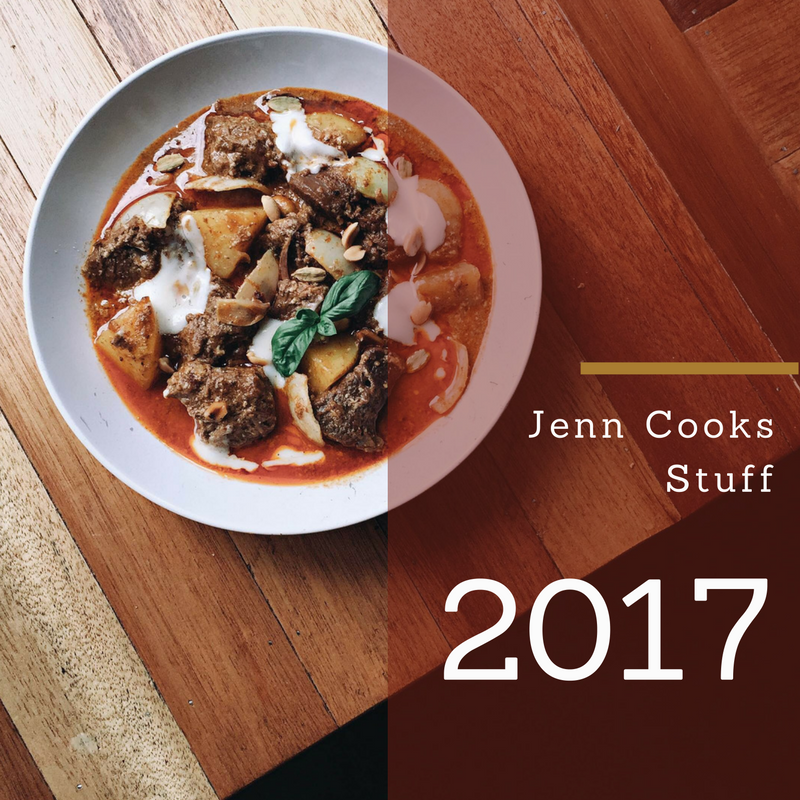 In 2017 I will be adding weekly “Cooking with Jenn” blogs. This sounded better than “Eating with Jenn”, which may be closer to the truth. As part of this new category, I am inviting you to take part! For those interested, I will share the monthly meal plan with you and you can cook along side us Haywards. The meal plan comes in a spreadsheet with one dinner recipe each day. Meal Plan hack: You can easily move recipes around from one day to another, no one will know! I will be sticking to the plan as I blog about it, but invite you to subscribe for inspiration if nothing else. The meal plan comes from recipes around the internet. Each meal will link to that recipe. 1. I am not a nutritionist. Things will be healthy of course, but this is not a “lose weight” plan. If you lose weight, super, unless you are under weight then you should see a doctor! 2. We like meat. This meal plan will not excite vegetarians. That said, we are putting a minimum of one vegetarian meal in each week, because we are learning as we go too and vegetables are apparently good for us! 3. There is no three, but I already started with the number formatting and a list of two doesn’t look good so I wrote this in here to have my list look balanced. There you have it folks. Jenn Cooks Stuff will be a weekly Sunday blog. Join in on the fun and subscribe for a small fee of $5 per month. Let’s have some fun, blogging and cooking together for 2017.